It is believed to be the answer to every chef’s prayers and is responsible for providing an added dimension of effortlessness to cooking and serving food as well. Yes, we do mean the electric skillet, that wonderful appliance which is not only capable of regulating cooking temperatures but also doing so accurately. All the while keeping the heat where it matters, cooking your food to perfection and preventing it from dissipating into your kitchen and making it become stifling hot and uncomfortable too. What’s more you also get to cook larger amounts than you would be able to with a conventional frying pan and serve it with it as well. And it just might fit into your dishwasher at the end of everything meaning you get to relax after a really enjoyable meal which has been cooked to perfection. If you think it all sounds great and would like to get one too, all you have to do is read through our reviews of the most popular skillets available. Doing so will ensure you will know just what to look for when it is time to purchase the one which will meet your needs. Everyone has memories of cooking for a large group of people and frantically attempting to keep track of what utensils to use, the contents of the pot or frying pan and the food which has already been cooked. If you find yourself having to do so on a frequent basis, the Presto 06857 might be the appliance you need to ensure everything all goes as smoothly as possible with perfect results. Heavy cast aluminum base with deluxe nonstick surface. Thanks to its heavy base the Presto 06857 will ensure even heat distribution while cooking your food ensuring impressive results. Its nonstick surface also means you can cook with less fat for healthier meals which are just as delicious. This electric skillet also comes with a built in spout which can also be used as a spoon and spatula holder when cooking as well as a glass cover making it easy for you to monitor the entire cooking process. All these features and more mean that you will be able to prepare healthy, tasty meals with peace of mind. 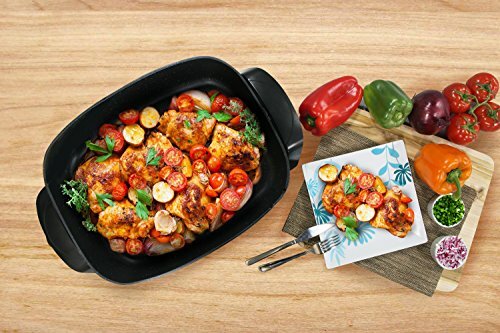 For an item which lets you cook loads of your favorite food to perfection, and serve it right afterwards while keeping it warm, the skillet is quite reasonably priced and really affordable. It actually costs less than some conventional frying pans which do not provide as many benefits too. What’s more, it helps save on energy due to its efficiency in this regard. All these qualities and more make it a great appliance to use in your kitchen. The Presto 06857 represents one of the most efficient and hassle free means of getting food ready from start to finish. And it can even be used in your dishwasher too. If you love enjoying your favorite meals or snacks and relaxing right away afterwards, you will love this appliance which has been made with you in mind. When choosing an appliance which is very likely to become a treasured part of your kitchenware collection, opting for a manufacturer which prides itself on exceeding expectations is always a great idea. And that is what makes the Proctor Silex 38526 worth checking out since it has been provided by Hamilton Beach which aims to constantly impress its client base. Preparing and serving a meal often requires using separate sets of kitchenware and tableware resulting in loads of washing up right afterwards. With the Proctor Silex 38526 which is capable of doubling as both kitchenware and tableware, you will be not only be able to prepare your food really conveniently but serve it in style too resulting in far less washing up once you are done. It is quite cheap making it a great bargain since it does feel as though you will be getting an appliance which is capable of serving as both kitchenware and tableware. This quality as well as several other benefits it comes with makes it definitely worth considering as a possible addition to your kitchenware collection. Considering all the qualities which this model provides, it is clear that the manufacturer does take pride in giving its client base with a great experience through its appliances. As a result you can be certain that you will get to enjoy all the benefits which it promises to implement in this electric skillet. When it comes to getting the one appliance that will provide you with the ultimate experience in grilled food, relying on the experts is highly recommended. And that is what makes the BLACK+DECKER GD2011B griddle such a great idea. There aren’t that many frying pans which let you cook eight servings all at once with the added benefit of usin reduced amounts of fat if you choose too. And that is just one of the benefits of using the BLACK+DECKER GD2011B which also comes with a drip to make it easier to clean up afterwards and is also dishwasher safe. It is really affordable in comparison to non-electric pans. It also comes with added benefits such as temperature control and a really large cooking surface. These features make it worth having for anyone who loves fried or grilled food. Everyone deserves to enjoy breakfast, lunch or dinner and thanks to BLACK+DECKER GD2011B it can become a daily occurrence. If you would love to start the day with perfectly cooked pancakes or omelets or sit down a supper of lightly grilled vegetables, getting this appliance would be a great idea. One of the best means of choosing an appliance is opting for a manufacturer which seems to know exactly what you want. It is certainly the case with the manufacturer DeLonghi America, Inc. which prides itself on being able to meet your cooking needs thanks to its De’Longhi BG45 Electric Skillet. Whether frying, cooking or stewing, you can be certain that the De’Longhi BG45 will take care of its contents efficiently thanks to its heating element which will ensure even cooking without the presence of any hot or cold spots. Thanks to its adjustable steam vent holes any possible buildup of vapor which may have adverse effects on the entire process is also released ensuring optimal results. For an appliance which ticks most of the right boxes in terms of the ideal electric skillet, the De’Longhi BG45 is really affordable and can even be favorably compared with conventional frying pans. As a result it is a great bargain which will certainly make cooking a lot more convenient for you. If you want an appliance which is ideal for not only cooking food in style and serving it just that way as well this option is definitely an ideal choice. Especially since you will be able to look forward to improved cooking times, great results and barely any washing up afterwards all a really great price. Getting an electric skillet is a great means of introducing an added touch of convenience and versatility to your kitchen and dining room. However the right appliance will also provide you with extra efficiency and safety. Could the BELLA 12 x 12 inch Electric Skillet, 1200 Watts 14607 be just what you need in this regard? A quick glimpse at our preview below will provide you with its key features which make it stand out. The special ceramic copper titanium coating used in the manufacture of this model is 8 times more durable than normal coating and capable of resisting temperatures of up to 850 degrees Fahrenheit. It is also impressively resistant to abrasion and is PTFE and PFOA safe. Due to its rather impressive range of features which make it stand out from other electric skillets you might expect the BELLA to be really expensive. However it is far from being the case as it is really quite cheap and is averagely priced in comparison to the other appliances covered in this list. Its highly competitive price means it is an option anyone can benefit from without having to break the bank. It certainly does stand out thanks to its special coating which is not only safe, but also resilient and free from harmful substances. The fact that it can also be used with metal utensils is also a big plus while its price is simply the icing on the cake. These qualities make it impossible to say no to such a great appliance which represents multipurpose convenience and versatility rolled into one. When it comes to grilling, frying, stewing with minimal effort, electric skillets which take up a minimum of space while enabling you to do so are certainly your best bet. And if you are considering baking or roasting as well, you need not worry either since the x Presto 06620 will meet all your needs in this regard. Getting the right temperature is essential for achieving delectable results during baking. Thanks to the Control Master feature you will be able to do just that and get it right every time as a result. Once the Presto 06620 features are taken into consideration, it becomes quite clear that it is a great bargain. Especially since it makes it possible for you to do so much more than the average electric skillet and also costs less than most of them. Whether going camping or in the comfort of your home, this skillet is an excellent means of enjoying freshly baked rolls, grilled food and just about anything else you wish to treat yourself to. The fact that it is really easy to use and also takes up a minimum amount of space makes it the perfect appliance for preparing food conveniently with a minimum of fuss. Most times frying and grilling come to mind whenever the word skillet pops up. However you don’t have to be limited to those choices when it comes to cooking with an electric one. Especially if you’d like to enjoy steamed food or even one pot meals. And it is all thanks to the versatile Aroma Housewares ASP-137 which will change the way you prepare your food, due to being really easy to operate and convenient to use. This electric skillet comes with a removable temperature control probe which can be used to set its temperature to up to 450 F. It is also really safe to use since its outer surface will remain cool during use significantly reducing the risk of any unpleasant mishaps while it is being operated. Most electric skillets are relatively inexpensive and come with a wide range of benefits. Hence it comes as no surprise that the Aroma ASP-137 is really affordable. As a result, it is a worthwhile purchase for anyone who would like to enjoy tasty, healthy food with a minimum of fuss. Purchasing this option means you will be able to treat yourself to a variety of healthy dishes are full of flavor. The fact that its temperature can also be adjusted also mean that you will be certain of guaranteed results each time you use it. These qualities in addition to so many others make purchasing it a really great idea. Once upon a time, catering to a large number of people meant using loads of pots and utensils and loads of washing up. Nowadays thankfully the right electric skillet can ensure you enjoy great results from your kitchen with just a fraction of the effort. And the Nesco ES-12 skillet might be just what you need in this regard thanks to its awesome qualities. The first thing which is noticeable about this appliance is its skillet which is actually deeper than most. At 4 inches it will provide you with the opportunity to take full advantage of various methods of cooking while its adjustable temperature control will enable you to monitor the process with ease to achieve great results. This electric skillet occupies a mid-range position in terms of pricing when compared to other similar appliances on this list. In spite of that it is really affordable and will bring an additional touch of convenience and style to your kitchen at a really great price. Stylish and versatile, the Nesco ES-12 will fit right in with your kitchen’s decor thanks to its neutral colors while providing you with an amazing experience while you prepare your dishes. If you want an appliance which can be used to cook large amounts of great food while adding a stylish touch to your kitchen, this electric skillet is certainly a great option. Especially since it comes at such an affordable price. Breakfast is the most important meal of the day which is why preparing it in style is so important. And thanks to the Presto 07061 griddle you will be able to surpass the limitations imposed by more traditional methods to treat your family to a delightful spread. Unlike traditional frying pans, this surface is large enough for cooking several pancakes, bacon rashers or patties at the same time. Thanks to its nonstick surface, you will not only be able to flip them with ease, but even prepare them with less fat if you want to. Because it is powered by electricity, you do not have to worry about any cold spots since the entire surface gets heated evenly further enhancing its usability. With its impressive size of 22 inches, this electric skillet feels like you are getting two large frying pans for the price of one at a really great price. As a result, its cost presents an excellent opportunity for you to enjoy your favorite breakfast in style every day. With its wide cooking surface, no hot spots, temperature which is easy to regulate, the Presto 07061 is the perfect kitchen appliance to enjoy the most important meal of the day the way it is meant to. And you don’t have to limit yourself to breakfast either since you can use it to grill meat, fish and even vegetables too for delicious meals throughout the day. Its amazing versatility in this regard certainly makes it worth considering. Electric skillets are a really great means of putting the fun back into cooking especially since they do everything faster and can even double as tableware too. However there are quite a few which come with extra features to provide a really special experience just like the Oster CKSTSKFM12W-ECO DuraCeramic. The special nonstick coating use in the manufacture of the Oster CKSTSKFM12W-ECO is not only PFOA and PFTE free but is also 4 times more durable. As a result it is resistant to scratching or peeling and great for preparing stir fries or even frying meat as well. The Oster CKSTSKFM12W-ECO sits at the lower end of the spectrum in terms of price. As a result it is a fantastic bargain which is worth taking advantage of for anyone who wants an inexpensive, multipurpose appliance for preparing their favorite dishes. With its special durable nonstick coating, cool touch handles and a glass lid which comes with a vent, it is clear that this skillet has what it takes to bring that extra touch to your kitchen in terms of versatility and usability. The fact that it is quite affordable is also an added bonus. Before purchasing an electric skillet, there are many things to consider. There are skillets which provide heat-resistant handles. These can come in handy when it comes to safety and convenience. Many of the electric skillets that are currently on the market are constructed from aluminum while others are made using stainless steel. The cost of these stainless steel items can also be more expensive than the aluminum. The Presto 06857 is constructed using a heavy aluminum material. The first thing to always consider before purchasing the best electric skillet is to recognize the cost range of various models on the market and choose which price you are prepared to pay. The reason for this point is recognizing an establishment on your present expenses as well as which features that may be required the most of your electric skillet. Select a suitable model that is inexpensive as well as providing the precise features based upon your demands. If you do not, you will discover that you will waste money on redundant merchandise. Various bonus features that may not benefit your needs should be excluded out of your standards when selecting an electric skillet. This will help you save money for any other needs you may have. However, if you are unsure of what functions of a merchandise is appropriate for your using intent, you should examine these options in order to discover some criticisms from users and professional cooks. While observing the numerous types of electric skillets, you should contemplate one that is assembled from strong resources such as stainless steel. However, stainless steel is thought of being more expensive. If you find that you are on a budget, you will find that hard aluminum works as well, but does not last as long. When searching for an electric skillet, it is a worthy notion to deliberate features such as size and shape of the cooking instrument. There is an assortment of shapes of a skillet; some can be rectangular, while others may be circular or square. It is best to select a piece which is an appropriate size and shape for your desire. Many skillets found on the market range in size between ten and sixteen inches, so it is important to contemplate what size you will need founded upon what kind of food you will be making while using the skillet. Another factor to consider is how many people you will serve while cooking because, smaller or larger sized skillets is appropriate for various purposes. You will find that there are some models on the market that come with temperature control, which allows you to adjust the heat from high to low. Other models only have a warm setting and contain detailed measurements. If you desire to use your skillet to deep-fry, then you will need a model that can achieve at least 450 degrees Fahrenheit. However, skillets that only reach up to 400 degrees Fahrenheit is appropriate for pan- or stir-frying. An imperative reason for attention is what cleaning process is appropriate for the skillet. There are some models that provide heat control separate from the pan, making it dishwasher safe, there are others on the market that may require proper cleaning with a rag. The Presto 06857 is one such electric skillet that allows for the skillet pan and cover to be removable and dishwasher safe as long as it is detached from the heat control. The Oster CKSTSKFM12W is one such model that does not come with a removable pan and will require to be wiped down. Furthermore, it is not dishwasher safe and is unwise to submerge the skillet or the temperature control probe. However, it may be a better choice for you to avoid skillets that need hand-washing if you like spending a lot of time cleaning. These kinds of lids are a perfect showcase when it permits you to look at your food while it is cooking. The glass lid is a great asset to have because electric skillets are inclined to warm food in high temperatures and this lid will allow you to keep an eye on your food before it begins to burn. Some of the electric skillets found on our list come with tempered glass lids such as, Presto 06857, Proctor Silex 38526, De’Longhi BG45, Aroma Housewares ASP-137, and the Nesco ES-12. It is relatively essential to discover any consumer reviews about the products that you mean to buy, but always consider which review is exposing the true operating experience without partiality. Any reviews that have both positive and negative aspects are great to take into consideration. Using reliable websites such as Amazon will aid you in finding the appropriate electric skillet that you desire. There are many reviews from customers that give unbiased opinions and tie in their positives as well as negatives. When looking for a good warranty policy, make sure that it guarantees the manufacturer will mend or exchange any undesirable damages during the time period. After reflecting some elements for purchasing an electric skillet, you will want to understand which features are great for an original product. Non-stick coating is another feature that every cook should have. With this feature, food will not stick to the pan. This aids significantly in the cleaning process. This feature will also help your skillet to be more durable and have a longer life span. An adjustable steam vent guarantees that no liquid can spill out during cooking. These handles make the cooking practice easier because you are capable of picking up the skillet without having to worry about being burned. Space saving for storage is a great feature for any cook to have. For example, the Presto 06857 contains fold down handles that detach from the skillet pan and the base and handles that fold in the base while the handles store within the skillet. What Type of Food to Cook with Electric Skillets? With an electric skillet, there are many things you can make ranging from breakfast foods to dinner, as well as desserts. Cooking meals this way also allows you to save time without having to clean up so many bowls as well as pots and pans after you are finished making your dish. A great advantage that an electric skillet provides is that it can maintain a steady temperature more effectively than when cooking using a pan on your stove. Electric skillets are perfect to use for frying anything such as doughnuts as well as cooking pancakes. Another advantage that an electric skillet provides is that it does not heat your kitchen up as a stove does, so cooking during the summer helps keep the temperature of the room down. There are many delicious lunches and dinners you can make using an electric skillet. You can cook any type of meat using one, such as beef, poultry, and fish. You can also use it to stir-fry your favorite vegetables. Using your electric skillet to roast up your favorite vegetables such as squash, green beans, bell peppers, peas, jalapeno peppers, zucchini, eggplant, carrots, and garlic are a great way to give yourself with a delicious dish as well as provide a nutritious meal that offers crucial vitamins and minerals to your diet. You can also serve up some delicious and creative dinners such as beef stroganoff, skillet lemon chicken with capers, vegetable soup, skillet lasagna, pork chops, skillet meatball, chicken and broccoli stir fry, shrimp, cilantro chicken, parmesan chicken, jambalaya, chicken cordon bleu, and so much more! For desserts, you can look forward to pies, cakes, and more. Some tasty recipes worth trying are listed below. For this recipe, the ingredients you will need include barbecue sauce, one cup of vinegar, two teaspoons of sugar, two teaspoons of Worcestershire sauce, ½ cup of ketchup, a teaspoon of salt, a teaspoon of dry mustard, a ½ teaspoon of pepper, and a teaspoon of paprika. First, you will need to preheat your electric skillet to 360 degrees as well as add oil. Cook your chicken, making sure all sides are brown for approximately twelve to fifteen minutes. Next, take out your chicken and empty the excess oil. Then you will want to set the dial to 260 degrees and place the chicken back in your electric skillet, as well as smothering it in your barbeque sauce. Cover and cook for twenty minutes turning the chicken adding more sauce. Next, replace the cover and open vent. Keep cooking the chicken for an additional fifteen to twenty minutes. First, you will want to melt your butter using medium heat. Next, add your green pepper and celery. Stir fry these ingredients for three minutes before adding your rice and broccoli. You will want to stir fry this mixture for an additional three minutes. Now, mix in your water, soup, salt, and basil. Then you will want to bring your mixture to a boil. Finally, you will want to reduce the heat and cover while allowing it to simmer for approximately twenty minutes or until the rice and broccoli are finished. Make sure to stir frequently. Next, you will need to add your butter, evaporated milk, and sugar, making sure to stir the mixture until it is brought to a boil. Allow the concoction to boil for approximately five minutes, stirring frequently. Next, turn off your electric skillet and add your vanilla as well as peanut butter. You will need to stir until your peanut butter is completely melted. Next, pour your creation into a lightly greased or buttered 8”x8” pan. Allow to cool and then cut into squares and serve! Q: What are electric skillets and why would I need one? Electric skillets are kitchen appliances which are capable of functioning as both cookware and tableware. They are especially useful since they enable you to prepare food using a variety of methods including grilling, frying, streaming and even baking while taking up minimum space in your kitchen. Q: What features should an ideal electric skillet come with? An ideal electric skillet should come with a temperature regulation feature. It should also be capable of preparing food using a wide range of methods. not unlike your oven. Additional features which would also come in handy include stay cool handles, steam vents and a resilient coating which is also free from harmful substances. To properly clean your electric skillet, make sure that it has cooled completely. Make sure to unplug the cord from the wall outlet as well as detach the temperature control from your electric skillet. Always wash the pan using hot and soapy water. While the pan needs to be soaked and hand washed, the lid may be washed on either the top or bottom rack of your dishwasher. However, if you prefer to wash by hand, make sure to use a nylon scouring pad or a sponge along with liquid dish detergent. Make sure that you do not treat with any abrasive cleaners or metal pads because they will damage the non-stick coating. Lastly, all you need to do is simply rinse your appliance and then dry. Q: How safe are they for dishwasher use? Their suitability in this regard depends on their manufacturer. Some providers manufacture appliances which can be cleaned using this method while others recommend the use of a soft sponge and a warm soapy solution. Q: What can you cook using an electric skillet? Electric skillets let you cook the same assortment of foods as a standard frying pan. You can cook anything from morning breakfast frittatas to steak fajitas as well as a pan roasted hen. An electric skillet offers the convenience of cooking one pan dishes. Q: What operations should be considered when obtaining an electric skillet? The first things to contemplate are shapes and size. Electric skillets provide a lot more cooking surface matched to standard frying pans, as well as can be found in various sizes and shapes. Such shapes include square, circular, and rectangular. With this in mind take into attention what this model will cost as well as how much counter space it will require. Also, keep in mind for a simple clean up, you will want to look at models that have a non-stick interior or a two-piece style that is detachable and dishwasher safe. Similarly, you will want to contemplate a model with a vented glass cover, because it helps uphold the interior stress down, avoiding liquids from running over. Q: What kinds of utensils are recommended for use while cooking with an electric skillet? Due to the non-stick coating, it is preferred that you only use wooden, plastic, or nylon utensils in order to prevent scratching of the non-stick surface. Q: Is it normal for one to have smoke accompanied by an odor when it is turned on? During the first use of this type of appliance, because of the manufacturing process, it is not uncommon for some minor odor and/or smoke. This is somewhat common with various heating appliances; therefore, it typically is not a cause for alarm. Q: Why won’t my skillet start working even while plugged in? There are several reasons for why this could happen. However, the most common reason could be because the controller for the temperature may not be inserted appropriately into the socket in the appliance. To avoid this mistake, be certain that the temperature control is firmly implanted into the skillet’s side. It is suggested that in order to obtain the best results, you should always make sure to insert the temperature control into the element before plugging it into electrical outlet. Then modify the temperature control to your desired setting.